The Liberty stadium has an all-seated capacity of 20,532. The clubs main stand is off to the visiting supporters right in the west stand. There are no bad seats in this stadium and every section has a completely unobstructed view of the action. The more vocal fans sit in the east stand toward the north end. Visiting supporters are situated in the north stand behind one of the goals where up to 3,500 fans can be accommodated. The leg room and views from this area are excellent and as you'd expect from a stadium as new as this, the facilities and refreshments are up to scratch. There are no away tickets available on the day of the game so please remember to purchase yours in advance. The nearest pub is the Morfa Parc which is just opposite the South Stand. There are a lot of home supporters who go there for a pre match and post match pint. However there is very reasonably priced food there and being so close to the stadium it allows time for you to fit in an extra beer or two. Opposite Morfa Parc is Frankie and Benny's which allows home and away fans in. Their meals are priced at between £12 and £15 per head, but it is worth the extra cost as the food is excellent. Opposite the stadium and over the dual carriageway there is Pizzeria Vestivio which is a lovely Italian restaurant offering stone oven cooked pizzas. Street parking is available within a short walk if you arrive at the stadium early enough. The club also operate a park and ride service charging £5 per car including the bus trip. Do be aware of resident only sections if you choose to street park but this option does seem to be a favourite of some fans as it appears to be the quickest option for escaping afterwards. The nearest / closest train station to Swansea City's Liberty Stadium is Swansea Central. Swansea is well-served by both Arriva Trains Wales and First Great Western with hourly services running from London Paddington and Manchester Piccadilly. To walk to the stadium, turn right out of Swansea Central and continue up the High Street past the Palace night club and the Church on your left. When you get to the crossroads turn right again onto Neath Road and continue on past Mamma’s Pizza and the havod housing offices. You will eventually get to a roundabout and the stadium is just to the right. Refreshments: Another plus of parking at Landore Social Club… we could get a drink! Wasn't too packed, the drinks were ice cold (ideal on a hot day like this was!) and they did food as well! Is there any more welcoming situation at an away ground where we could be the only two travelling fans in a bar, watching the early game on telly, ice cold drinks in hand, and stuffing our faces with curry? The ground is also on a retail park so has the usual Harvester (which was absolutely heaving outside with it being such a nice day! ), Frankie & Benny's, Pizza Hut, KFc and the like. Never tried the food in the ground being full of curry and all! Impressions: Apart from not having enough toilets, one of the best designed new grounds I've been to, if not the best. The concourse is big and roomy with tellies showing the early game, the police and stewards are friendly and leave us to ourselves, there is a lift up to the walkway for disabled fans, and that walkway between the upper and lower tier is huge, so loads of room for wheelchairs without there being any crowding. 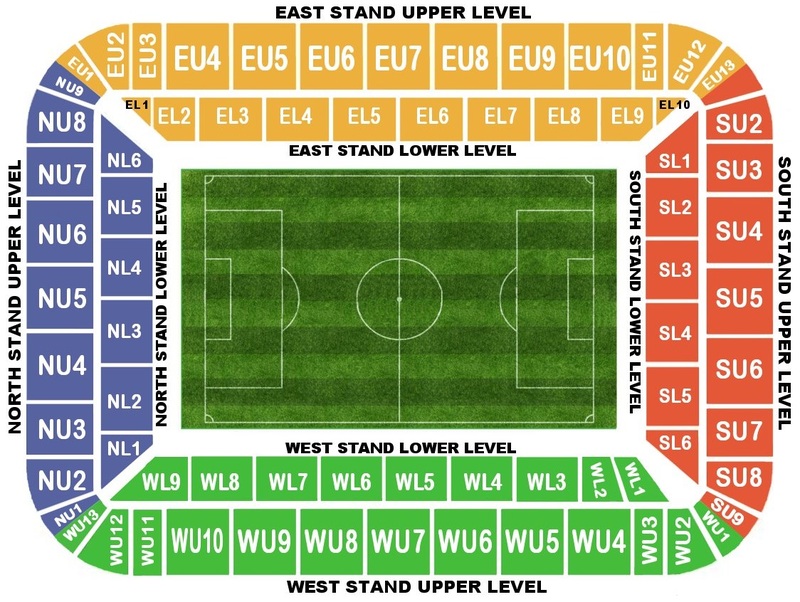 The ground has a uniform design of upper and lower in each stand, with the big walkway in between, very well designed ground. Atmosphere: The atmosphere from the Swansea fans was outstanding in the first half, as good as I've heard in the Premier League. They were pretty stunned once we took the lead though and quietened down while we understandably found our voices. Excellent in general though. Anything Else: There is a statue of Swansea legend Ivor Allchurch outside the ground. That and a strange bust of Robbie James. Enjoy: Friendly welcoming fans, great atmosphere, great facilities, good food. Away day perfection. It was a perfect day even before we won the game! 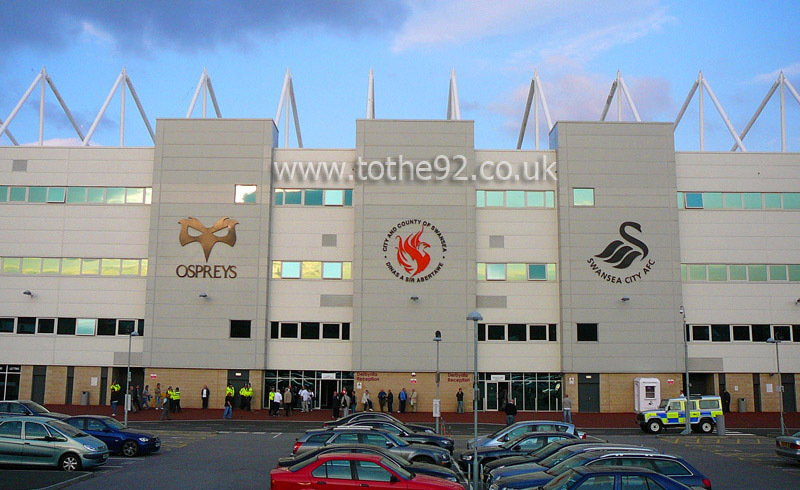 Have you been to Swansea City's Liberty Stadium? To tell us about your experiences and to feature on the site, simply complete the fans review form below!